Lift and level your RV quickly and safely. Fits the front or rear to provide the stability you need. When you are camping it is nice to stabilize your RV to eliminate rocking and sway, and to level it. RV’s that are not leveled correctly can experience problems with their appliances or systems in their coach. 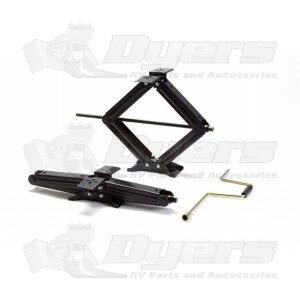 Our scissor jacks are the industries choice by manufacturers to stabilize and level your travel trailer and fifth wheel. Our jack can lift and level 5000 lbs each and our base will support your unit on soft surfaces. Keeps your RV Level and Stable. Expands from 4" to 24" in height. Bowtie Base sets well on soft surfaces. Holds up to 5000 lbs. per jack. 2 Jacks and Crank handle. the price was fair, arrived faster than I expected and after I installed them they were very smooth to operate. a very good product.